Of the many jaw-dropping artifacts contained inside the Metropolitan Museum of Art in New York City, some even venture into the territory of “I can't believe this even exists." 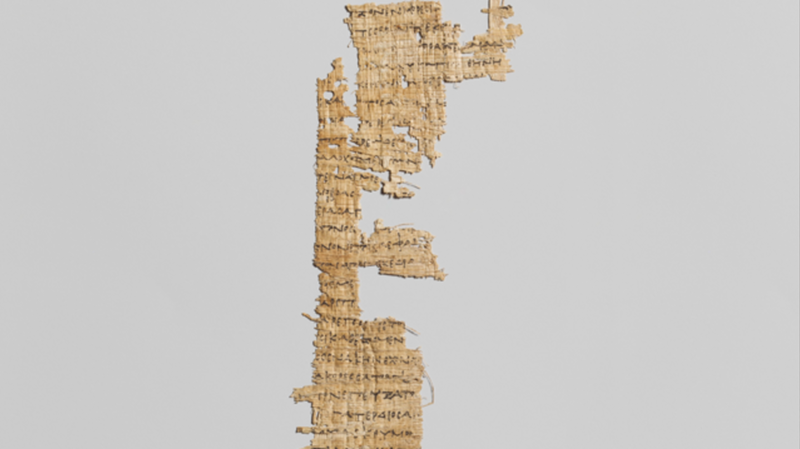 One such item is a papyrus fragment with lines from Homer’s The Odyssey, dated to around 285-250 BCE. As any good student knows, the poem originated as a composition in the oral tradition and was passed down as such, and Homer, being a man of the 8th century BCE, wouldn’t have been the one to create such a document. Still, the fragment is incredibly significant as it’s the first early Ptolemaic fragment of The Odyssey ever discovered. Interestingly, it deviates from the standard text we read today, illustrating something we knew already—that when stories are passed down telephone-style, they’re subject to change. Specifically, the papyrus contains three lines from Book 20 that we don’t read today. The museum received the fragment from the Egypt Exploration Fund in 1909 and it now sits on display in Gallery 163, Hellenistic Treasury: Third–First Century BCE. As the description from the Met notes, Homeric texts were the basis for the first comprehensive public library in history in Alexandria, Egypt, which was founded by Ptolemaic kings in the early third century BCE. That library contained copies of Homeric poems from different city-states, including Chios, Argos, and Sinope, and Alexandrian scholars were the ones to institute a standard version of such texts.